Want to escape the tourist crowd in the Milford Sound area but only have one day? I found the perfect option for active travellers to see this beautiful part of the world. Travelling to New Zealand? Check out our guide here. Or keep reading to find out more about the scenery of New Zealand's South Island. 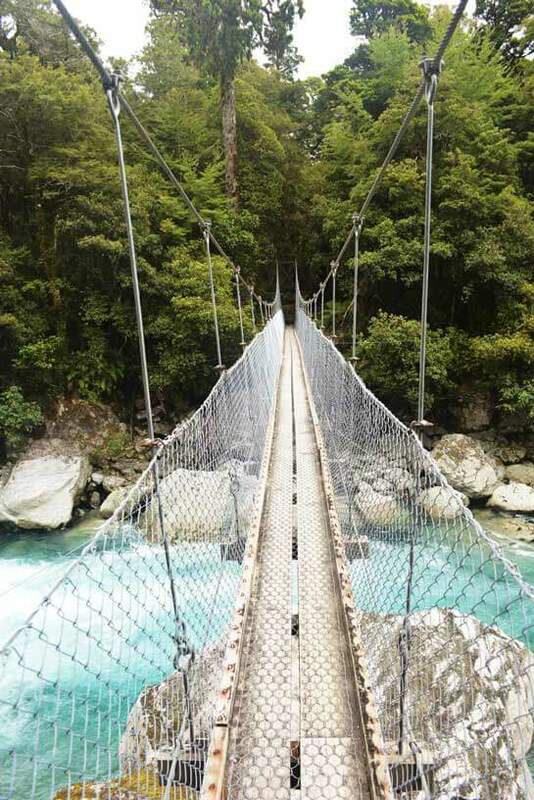 While the multi-day Milford Track is a great way to explore the Fjordland National Park - there’s several short hikes you can do along the Te Anau to Milford Highway – and the good news is you’ll probably only see a handful of tourists even in summer. 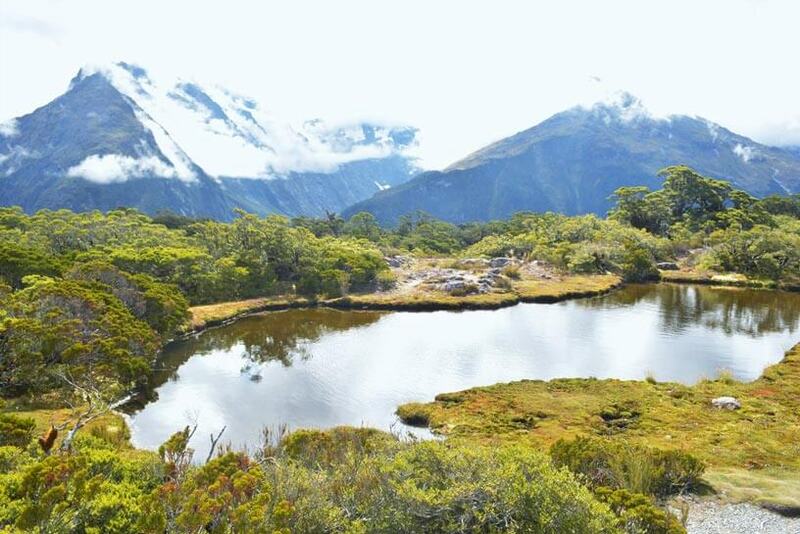 If you only have time for one hike along the Te Anau to Milford Highway, make sure it’s the hike to Lake Marian. This is what I came to New Zealand to see. 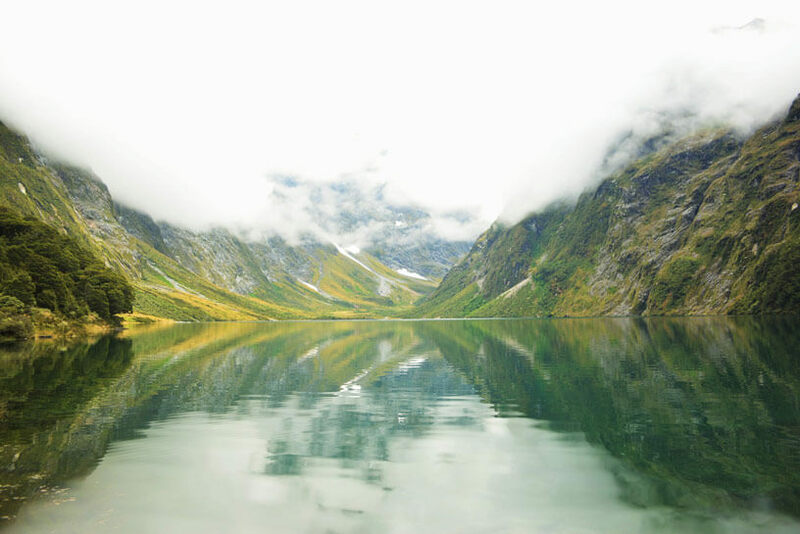 This hike through the wilderness is breathtakingly beautiful – both the trail through the beech forest and then the view of the alpine Lake Marian. The hike is marked as three hours return but you can do it in two hours if you’re of reasonable fitness. 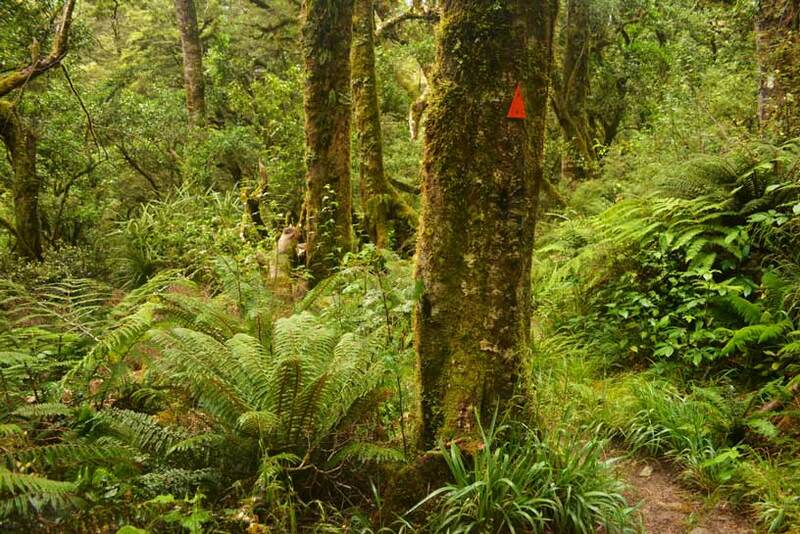 The trail starts 1km down the Hollyford Road, off the Milford Highway. Head across a swing bridge over rapids before joining a flat gravel path leading to a boardwalk over a fast running series of cascades. Spend some time taking in the view before heading uphill. From here, the path gets rocky and steeper as you go up. The higher you get, the more humid it feels as the path gets a little more steep. Make sure you follow the orange triangle markers – at some points along the path it can be a little hard to follow the trail as it heads along dry creekbeds and around trees. You’ll spot the markers on trees and steel posts along the trail. It’s a peaceful walk along rocky terrain past large beech trees and at some points you can hear the roar of the cascades. The terrain changes a lot from creekbeds to forest and then there’s a bit of mud so it keeps the walk interesting. If you start early, there probably won’t be many people on the trail and you’ll have the trail to yourself most of the time. In just over an hour you should reach Lake Marian. Hopefully the cloud will stay away and you’ll have expansive views over the clear water of the lake and across to the surrounding mountains. Take a refreshing dip in the water at least to get your feet wet and cool off from the hike. The return trip should be a bit quicker and you’ll probably get down in around 45 minutes depending on how your knees go downhill rocky terrain. Make sure you bring plenty of water with you on the trail. There are bathroom facilities both at the trailhead and at Lake Marian. From the Lake Marian trailhead, you can go further down the road for a quick trip to Humboldt Falls. It’s a gravel road down to the falls and it will take you about 15 minutes to drive. The road is fairly good with some potholes but is accessible by a 2WD vehicle – just take it slow. It’s a 20 minute walk along the trail to and from the falls. If you’ve got the time, consider doing the Key Summit trail. The hike will take you about 2.5 hours to complete and has views across mountain ranges, valleys and over to the other side of Lake Marian. The trail starts from The Divide carpark and follows the popular multi-day Routeburn Track at the start. The Key Summit trail is a switchback gravel trail with a steady incline. There’s several lookout areas along the way and up the top over the Hollyford, Greenstone and Eglinton valleys. At the top, there’s also a nature walk over a series of wooden boardwalks past alpine lakes and shrub land. 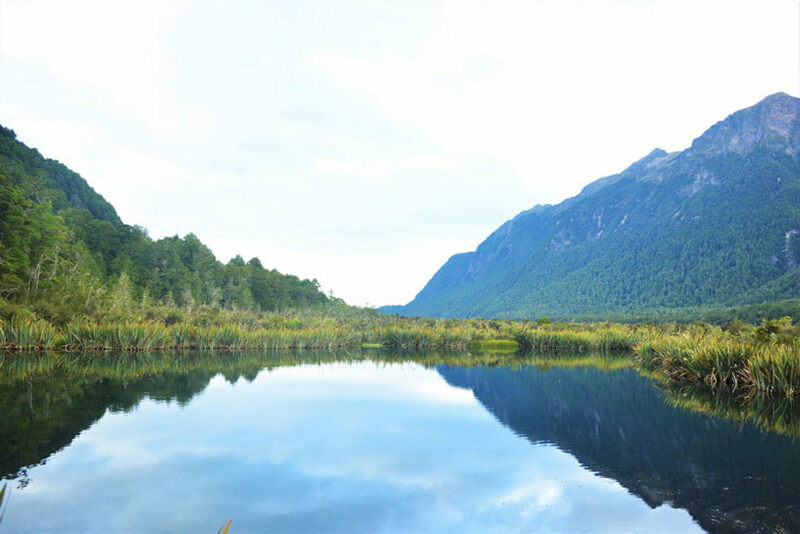 Other places to see along the Te Anau to Milford Highway include the Mirror Lakes viewpoint – go early in the morning to see the reflections of the Earl Mountains on the lake – and The Chasm – a roaring canyon in the rainforest formed by the Cleddau River. 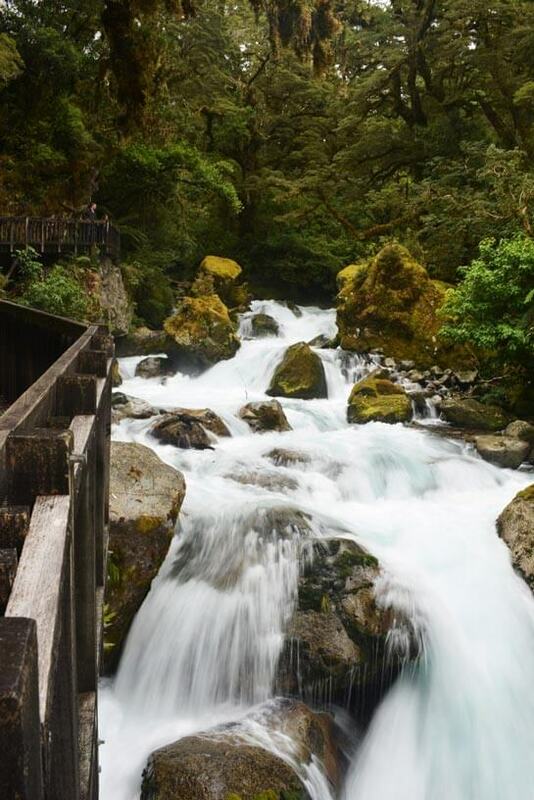 There’s 14 key scenic spots on the Milford Road. Your accommodation should have a list available of all the key hikes and photo spots. 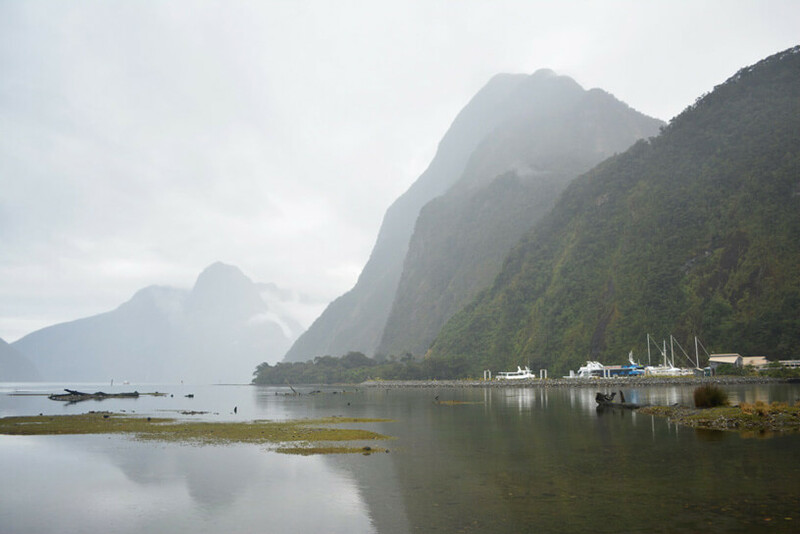 Of course, there’s also the Milford Sound itself – but prepare to be one of many tourists. A cruise is a great way to see it but if you don’t have the time, you can still get a good view of the sound along the foreshore near the carpark (even in the rain) or walk 15 minutes up to the Milford viewpoint. You can also kayak parts of the Milford Sound. Te Anau (pronounced Te-A-No) is your best accommodation option when exploring the road to Milford Sound, and the small town offers campsites, hostels and hotels. Te Anau Lakefront Backpackers is a good option with beds not bunks in dorm rooms and a good location right on the lake. Some dorms have kitchenettes and a bathroom. The hostel also has a well stocked common kitchen. There’s plenty of carparking on site and free street parking right outside. Te Anau is a tourist stop in its own right for its glowworm cave. The caves are on Lake Te Anau’s western shore and accessible by boat only. Boats depart from Te Anau up to six times daily in summer and twice a day in winter. You’ll need to hire a car to follow this itinerary. You can easily hire a car from Queenstown and then it’s a two hour drive to Te Anau – a good base to explore the Milford Road from. There’s no food or drink stops along the Milford Road so bring plenty of water and buy food in Te Anau before you go. There is a small café at the departure point for Milford Sound cruises but it’s very expensive. You should also make sure you leave with a full tank of fuel – there’s no fuel stops on the highway. If you’re driving the Milford Road, leave early before the tourist buses start heading in. It took me under two hours to drive the road leaving at 7am from Te Anau but my hostel said you can add up to an hour if you head in with the tour buses. I drove straight to Milford Sound to have a look then worked my way back. Bring insect repellent. Sandflies are rampant in New Zealand – cover yourself with insect repellent otherwise you’ll be itching for days. If you want to go on a Milford Sound cruise – you’ll need to book ahead especially during the summer months.